Big soulful eyes, big ears and big feet -- it's a wallaroo and he hopped right into your heart. If you have your heart set on owning a wallaroo, you'll have some work to do to make sure you can provide him a proper home. Space, security, nutrition and costs are things to consider when you want to own a wallaroo. You have to travel quite a long distance if you want to find a wallaroo in his natural habitat. Native to Australia, the wallaroo is in the family Macropodidae, just as the kangaroo and wallaby are. Generally, the difference between all three marsupials is size: Kangaroos are the largest of the three, wallabies are smallest and wallaroos fall in the middle. This guy can reach up to 100 pounds and live almost 20 years, entailing a significant commitment from his owner. There are a variety of exotic pet breeders in the U.S. who breed and sell wallaroos. If you're an apartment dweller or living in a neighborhood or housing development, it's probably best to reconsider the idea of a wallaroo because this fellow needs space. Consider that he lives in the pastures of Australia when he's in the wild and that he enjoys jumping; for you, this means a large, very securely fenced yard. The fence should be a minimum of 6 feet tall, and he should have at least 2,000 square feet to roam. Security is important not just to keep in your wallaroo, but to keep out unwelcome visitors. Small as they are, house cats can pose a threat through the spread of toxoplasmosis -- cats are prone to eating rodents with the parasite, spreading it through their poop. If your wallaroo comes into contact with infected cat poop, he can become lethally sick very quickly. It's not unheard of to have a wallaroo in the house, and if you do, you'll need diapers as these fellows don't tend to use a litter box. As well, you'll need to clear your house of any fragile objects to get them out of his way while he jumps. Given the impracticality of having him in the house when he's not jumping through the yard, he'll need his own shelter outside. If you're lucky and your temperatures range between 40 and 80 degrees Fahrenheit, you won't have to worry about heating or cooling for your unusual pet. However, beyond that range, you should provide him some sort of heating device during cold months and shade, perhaps with a mister, during hot months. Wallaroo lovers advocate getting a wallaroo while he's still nursing so you can bond with their pets. If you go with a baby wallaroo, be prepared to bottle feed him formula every few hours, depending on his age, until he's able to eat on his own. In their native environment, wallaroos are herbivores, grazing on grasses and shrubs. Providing your wallaroo with a grassy space for grazing will be appreciated, as will orchard grass hay. If you have shrubs accessible to him, make sure they're not toxic, such as ivy, red maple and red cherry leaves and branches. His regular diet should include commercially available macropod food, and clean, fresh water always should be available. As an exotic pet, your wallaroo may not be allowed in your neighborhood, town, county or even state. Exotic pet laws vary widely according to state and municipality. Even if your state welcomes the wallaroo, your county may not. If he is welcome, check to see what permits you'll need and make sure you make it official, as a pet wallaroo undoubtedly will bring you attention. It's just as important to make sure you have access to a veterinarian to oversee your wallaroo's health. 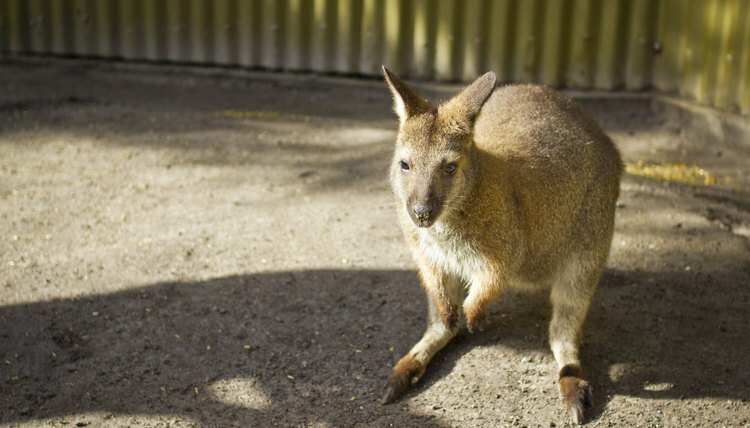 Not every vet is qualified -- or wants -- to care for an exotic animal such as a wallaroo. Verify your pet will have a place for care should he become ill.
Lolly Brown notes in her book Wallaby and Wallaroo Care that there's a financial commitment to owning a wallaroo. Purchasing a wallaroo can range between $1,000 and $4,000, and if your space isn't adequately secure, plan to spend additional money to set up your new pet's living space. She estimates the cost of food for one wallaroo to range between $200 and $400 per month.